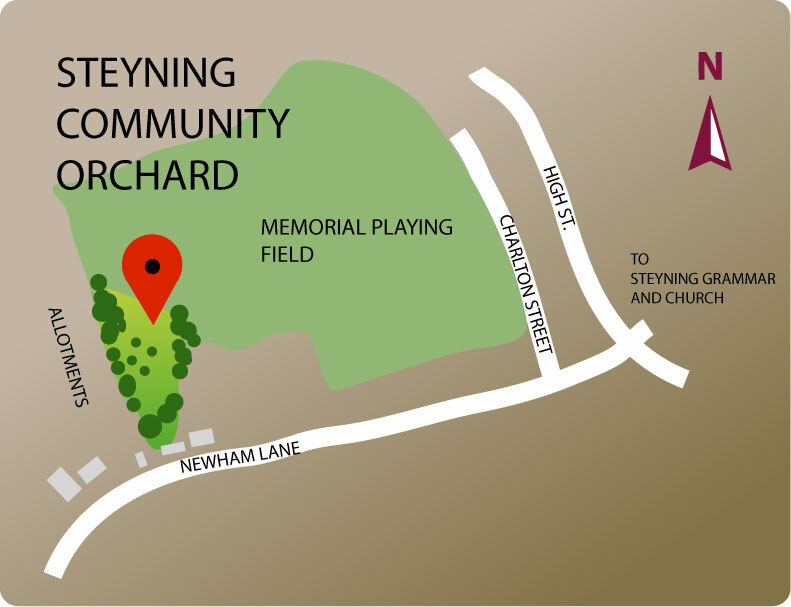 The Orchard is located in the South West Corner of The Memorial Playing Fields (BN44 3LR) in the centre of Steyning, adjacent to the Rublees Allotment hedge. Access to the Orchard is via the two twittens off of Newham Lane, one is at the entrance to the allotments and the other a few hundred meters further down the road. Other access is available from entrances in Charlton Street and Mill Road. Steyning had a number of orchards which have now been lost and the SCO group has been researching their history. 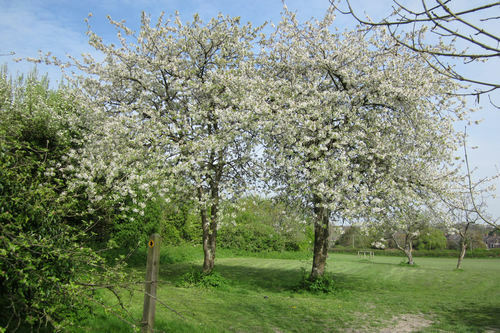 The orchard in the Memorial Playing Field was planted by the Wood family in the 1930s. The land was acquired by the Parish Council and incorporated into the Memorial Playing Field in 1972. Many trees were lost and damaged in the Great Storm of 1987. Research into the MPF Orchard area is continuing. If you have any information or photos that might show what the area once looked like, we would love to hear from you. In addition to the new trees we are planting, there are 9 apple trees remaining from the old Orchard area. Several of these were only uncovered during our clearing work. They vary in age from ancient (prob over 80 years old) to possible self-seeded trees only a few years old. We have a programme of gentle pruning, and clearance of ivy and scrub, in order to give them a chance to recover and fruit. There are many self-seeded Cherry Plums in the Orchard. We have selectively thinned and pruned these, to leave a good selection of the many different colour forms. They flower in April and are a great source of early nectar for foraging bees and bumblebees. The fruit makes wonderful jam! Although there are no original pear trees remaining in the Orchard, we are planting some new ones. There are just 2 plum trees remaining from the original Orchard. These are both in poor condition. We will try and keep these going as long as we can, but meanwhile also plant replacements. The following 12 Heritage Sussex variety apples. All grafted onto MM111 vigorous rootstocks, so that the trees should grow into large traditional orchard tees with a lifespan of up to 125yrs. 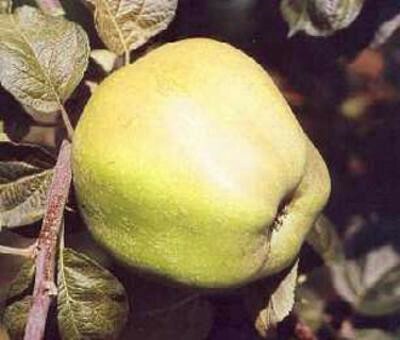 The oldest known Sussex apple. Uncertain origins, but it was grown at Parham House, Storrington in 1629. This small apple has a sweet rich tangy lemony flavour. It has also been used for cider. Fell out of fashion by the 1890s for being too small. It is picked in early October, and can be stored until the end of March. Tree planted Oct 2014 on Apple Day. Donated by Terry Gould in memory of his wife Mary Gould. 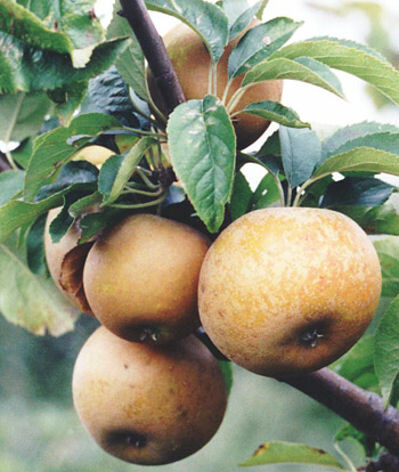 Knobby Russet was first shown to the London Horticultural Society in 1820, by a grower who came from Midhurst. The skin is heavily russeted and covered in knobs or warts, giving it a very strange and eye-catching appeal. 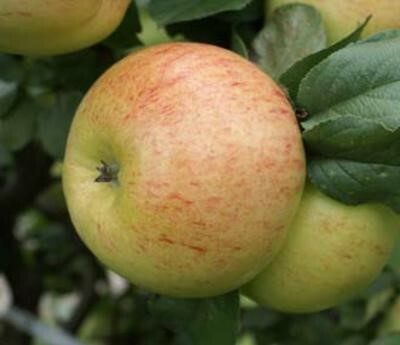 It has been described as ‘the ugliest apple in the world’ ! 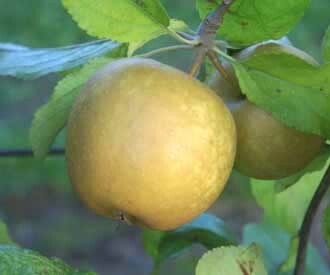 The apple flesh is cream coloured, crisp, with a sweet rich flavour. It is ripe in October and can be stored until March. Tree planted Feb 2015. Donated by Roger Brown in memory of his parents Frank and Betty Brown. As the name suggests, it arose on the estate of Lord Egremont, Petworth House. The head gardener Fred Streeter (the BBC gardener 1935-1975) maintained that it was raised at Petworth by Mr Slater and Lord Egremont together with Petworth Nonpareil (now lost) and Bossom. It was first recorded as a variety in 1872. It is usually picked under-ripe for the supermarket trade, so the full flavours never develop. 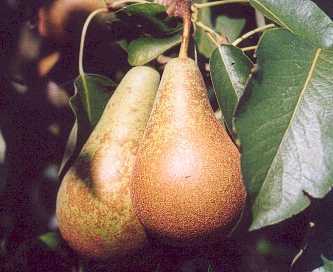 If left on the tree until it is properly ripe, it has sweet, crisp, nutty, smoky flavour. Fruit picked in October will store until December. Tree planted Feb 2015. 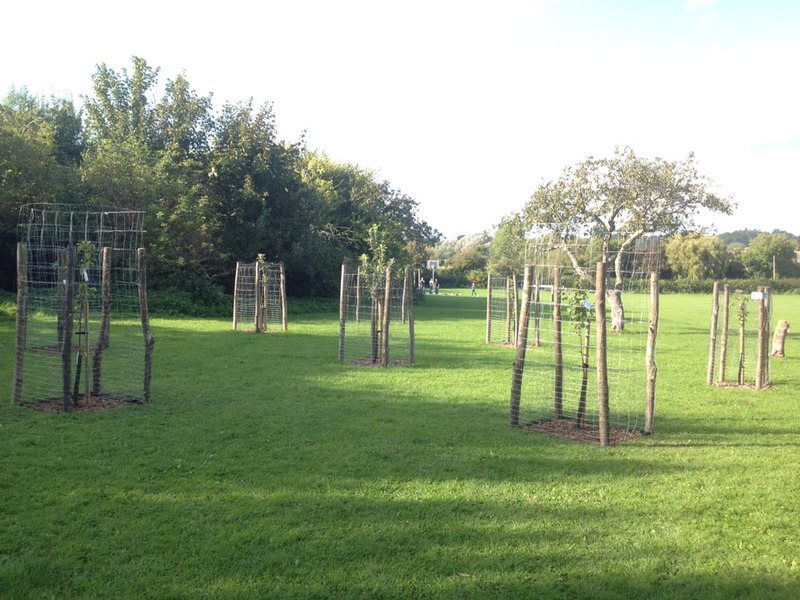 Donated by Susie Acton in memory of her father Lewis Wood who first planted this orchard in the 1930’s. This variety was probably raised at Petworth House by Lord Egremont and Mr Slade in 1820. It was exhibited at the London Horticulture Society in 1826. Was considered to be a culinary apple. The last known tree was growing in the garden of Miss Scott of Graffham, but blew down in a gale in 1986. Grafts were quickly taken thus saving the variety from extinction. The fruit is large and conical. 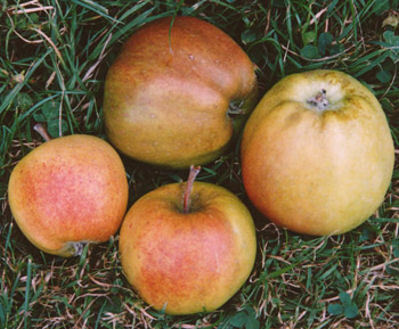 The skin is pale greenish yellow, covered with russet and occasionally marked with red. Flesh is yellowish white, tender, crisp, juicy and sugary with a pleasant sub-acid flavour. The fruit ripen in early October and can be stored until January. Still a very rare apple. Tree planted Feb 2015. Donated by the Carpenter Box Charitable Trust. Introduced by the Head Gardener From Leonardslee Gardens in 1880. Named after the eminent Victorian pomologist Robert Hogg. A very large cooking apple which is ripe in September. The flesh is rich and sweet. Excellent for baking and cooking to a purée. Attractive stripy blossom. Recorded by Hogg in 1851, but believed to be much older. 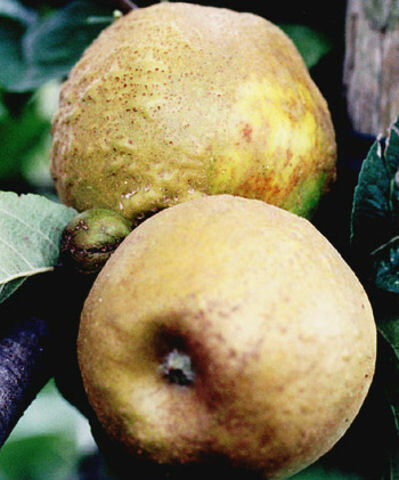 Known as the ‘Cottager’s Friend’ as it can be used for cider, for cooking and then by Christmas is sweet enough to eat. Widely grown in Sussex and Surrey in the C19th. The name Forge derives from the old iron working areas of the Weald, especially around Crawley and East Grinstead. Fruit is ready to pick late September and stores until December. Tree planted Sep 2015. Donated by Jan Whittle in memory of her husband Leonard Whittle. 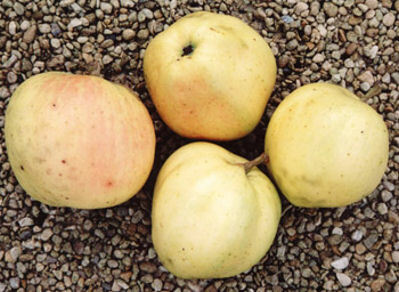 An old Sussex apple sent to the National Fruit Trials in 1937 by Mr Fred Streeter, head gardener at Petworth House. 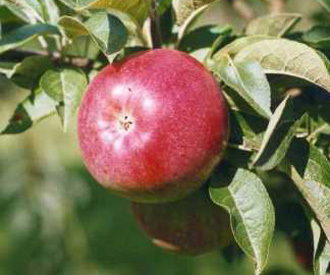 Middle to late in season, it is a large, tall and often conical apple with pronounced ribs. The body is pale green/yellow, flushed with orange, scarlet and carmine stripes, with russet dots. The flesh is crisp, white, with a good blend of sweetness and sharpness. Dual purpose, but perhaps more cooker than dessert. Picked in early October It keeps to December. A rare apple. Tree planted Sep 2015. Donated by Joyce Sleight in memory of her husband Geoff Sleight. 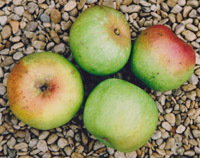 A nineteenth century dessert apple, described by Hogg* in 1884, and still found growing in Sussex, especially around Heathfield. 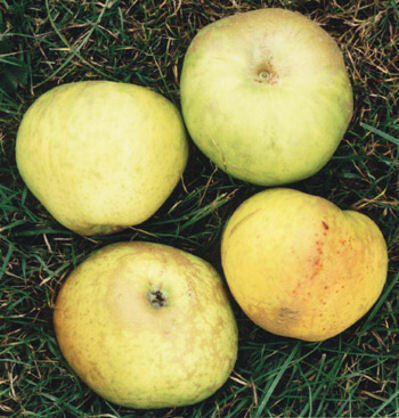 The green apples are conical and angular, become yellow, sometimes with a flush, sprinkled with russet dots. Has a sweet, spicy taste. Picked in early September it is used straightaway as it softens quickly. Hawkridge “is a very popular apple in East Sussex especially around Hailsham, Heathfield and those parts where it is met with in almost every orchard and garden” wrote Robert Hogg in 1851. The origin is Hawkridge Farm, Hellingly, near Hailsham. It is a medium sized apple. The skin is golden yellow with pale red stripes, flushed a dark bright crimson with darker stripes. The flavour is sweet and sometimes described as balsamic. This is still a very rare apple that is not in the National Apple Collection. Tree planted Feb 2016. Donated by Jane Oxley in memory of her grandfather Samuel Durrant Oxley. Shepherd’s Pippin. It was renamed Alfriston in 1819. It stores well, and was once popular with sailors on long voyages. It keeps its shape fully on cooking. Tree planted Oct 2016. Donated by Anne Hill in memory of Evelyn Bristow and Anthony Hill. 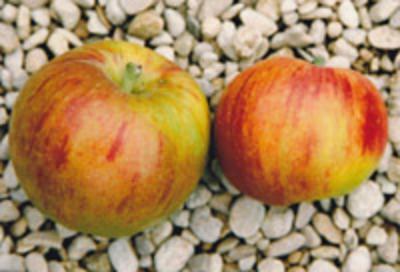 First and Last is an apple from Horsham, Sussex first identified in 1880. 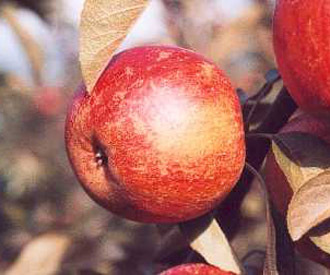 It is so called because some apples ripen early, while others later. A rich flavour hinting of pineapple. Dual purpose cooker and eater. Popular in late Victorian Brighton markets. Tree planted Oct 2017. Donated by Jacqui Stace in memory of her husband Jerry Stace. Mr.Turley, a blacksmith of Uckfield, found the original tree growing from some cider pressings in a hedge around 1770. His grandson John Mannington a butcher in Sussex sent it to the London Horticultural Society in 1847. 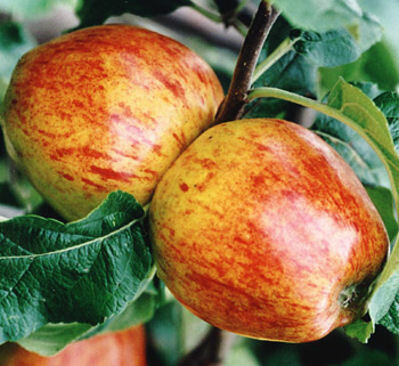 The apple ripens in late October and is crisp and juicy, with a richly flavoured flesh. Heavy crops. It will store until January. 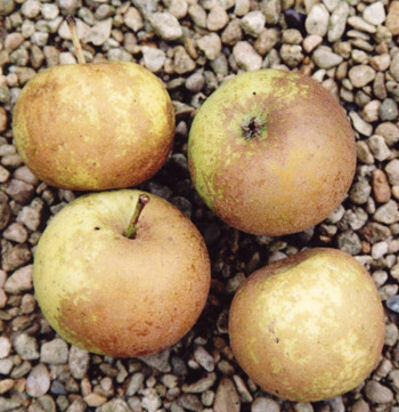 Mannington’s Pearmain is now a relatively rare Sussex apple. Thought to have originated in Europe. It was known in England before 1750. Fruits have firm, rather dry flesh with a sweet and rich aromatic flavour. 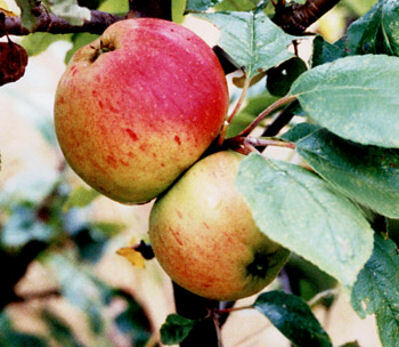 It was being grown at the Chequers Garden Orchard in Steyning in 1898. Developed in Kent in 2003. Tree planted March 2017. Donated by Anne Jennings in memory of her parents and sisters. Vincent and Olive Jennings, Helen and Lucy. A pretty early to mid season pink flushed apple. Fruits have greenish white, rather soft, very juicy flesh with a sweet refreshing vinous flavour. Developed in Kent in 1929. Tree planted March 2017. Donated by Pat Carroll in memory of her husband James Carroll. 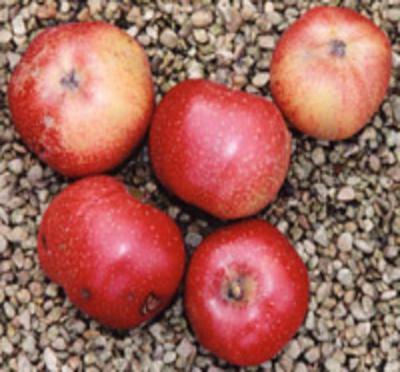 Catshead is an old English cooking apple, possibly dating back as far as 1629. Well known in the 1700’s. 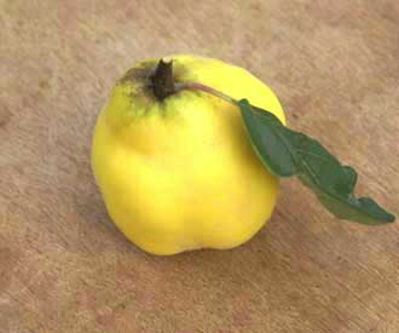 A block shaped apple (hence its name). Picked in October it will keep until January. Tree planted Feb 2019. Donated by Ann Taylor in memory of her husband Brian Taylor. 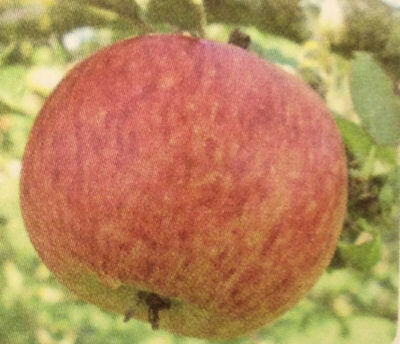 Reverend W Wilks is a large early cooking apple introduced in 1908. Named after the then secretary of the RHS. Cooks to lemon puree, also good for baking needing little sugar. Ripe late August/early Sept. Fruits have creamy white, melting, juicy flesh with a rich, sweet flavour. Developed in Kent in 1938. Tree planted Mar 2017. Donated by Peter Legge for his daughter Beth. 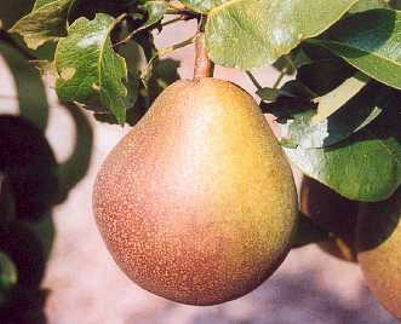 Concorde pear was raised in Kent in 1977 from a cross between Doyenne du Comice and Conference. 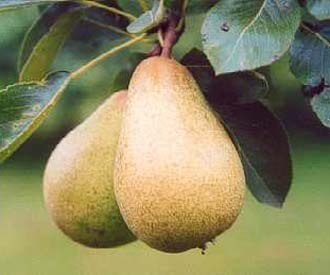 Fruits are pale yellow with a juicy, smooth flesh and sweet, pleasant flavour. Makes a compact tree and has heavy crops. Tree planted Mar 2017. Donated by Bruce and Marion Jeffery to celebrate their Diamond wedding anniversary. 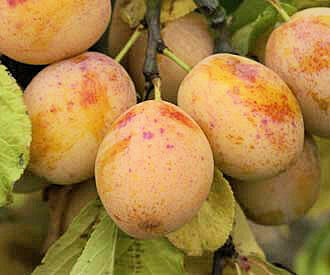 The Dundale plum from Lamberhurst Kent, is believed to be the original Warwickshire Drooper. It was first grown on a commercially in the Midlands and the name changed to Warwickshire Drooper. Medium sized, oval-oblong fruit. Yellow skin speckled with red spots. Tender, yellow flesh. Thick skinned. Quite sweet. Fruit hangs well on the tree. Can be eaten off the tree or used for cooking. Very heavy regular cropper. Attractive tree particularly in the early autumn when it has long hanging branches full of yellow plums. Tree planted Mar 2017. Donated by Lynn Reed in memory of her parents John and Vera Mantle. 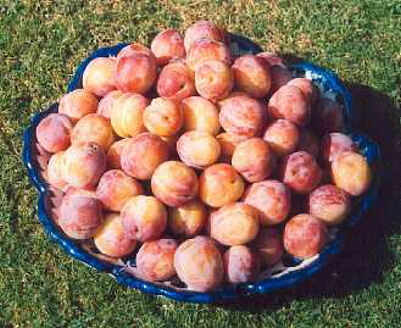 Medium to large, round conical fruit. Rough, light green skin covered with a fine bronze russet. Occasional red flush. Creamy white, tender, juicy flesh. Sweet, aromatic flavour with a hint of rosewater. Tree planted Feb2016. Donated by Lorraine and Rob Fowlie in memory of father-in-law Robert Richard Fossey. Was introduced to Britain in 1858. 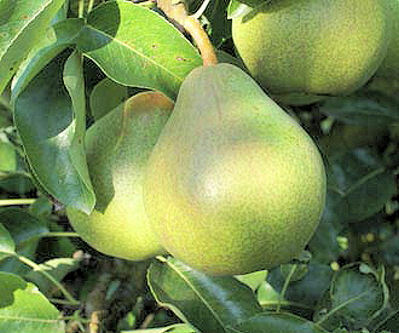 Considered as one of the finest dessert pears. Pale green skin turning pale yellow. Pale yellow, juicy, smooth flesh. Very sweet, delicious flavour. Medium sized, oval-oblong fruit. Reddish purple flush over a yellow bloomy skin. Speckled with small white spots. Firm, pale gold flesh. Free stone. Good sweet flavour. A heavy regular cropper. Raised near Pershore, Worcestershire in 1877. Medium large, oval fruit. Purple skin turning blue-black when fully ripe covered with a lighter coloured bloom. Firm, dry, yellow flesh. Quite sharp flavour. 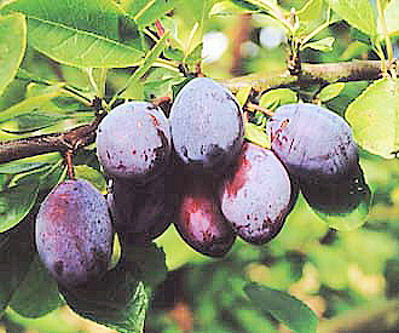 Best used as a cooking plum producing an excellent colour and flavour when stewed or made into jam. Also very suitable for freezing. If allowed to ripen well it can be used as a dessert plum. (for description, see earlier entry under the Sussex Apple collection). excellent for making quince jelly.